STI Tire & Wheel is bringing a new level of innovation to the ATV/UTV aftermarket with the launch of the HD1 wheel. What sets this model apart is its unique non-stick, Slik-Kote finish, which sheds mud like no wheel before. This high-tech, rugged, deep gray finish reduces mud and debris buildup and resulting unsprung weight, which can compromise the machine’s power, handling and ride. It also makes post-ride cleanup exceptionally easy. The HD1 wheel’s heavy-duty construction adds to its innovation. This advanced one-piece alloy wheel features both inner and outer wheel lip reinforcement. Most wheels in this class use only outer lip reinforcement. Like STI’s other HD Series wheels, the HD1 carries a lifetime structural warranty. The STI HD1 debuts in 12×7 and 14×7 sizes, to fit most popular utility/4×4 ATVs and side-by-side UTVs. A special, matching HD logo wheel cap is included with every wheel. The 12×7 has an impressive 700-pound load rating, while the 14×7 size provides an 800-pound load rating. Despite its cutting edge features, the STI HD1 is surprisingly affordable, making it a top choice for anyone who prefers to do their motoring in the muck. 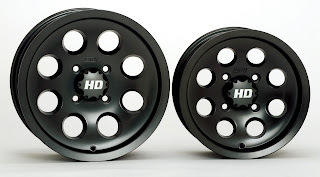 STI HD1 Slik-Kote wheels are available at finer ATV/UTV dealers everywhere, through MTA Distributing. For more information, to place an order or to locate an STI dealer, visit www.mtadistributing.com or call: East (318) 255-0049; West (951) 272-0971.